This dish cooks in a slow cooker over the course of two days, so make sure you start it in plenty of time. Season the short ribs on all sides with the salt and pepper, then sprinkle evenly with the flour. Heat the olive oil in a heavy-bottomed pot over medium high heat. Working in batches, brown the short ribs on all sides. 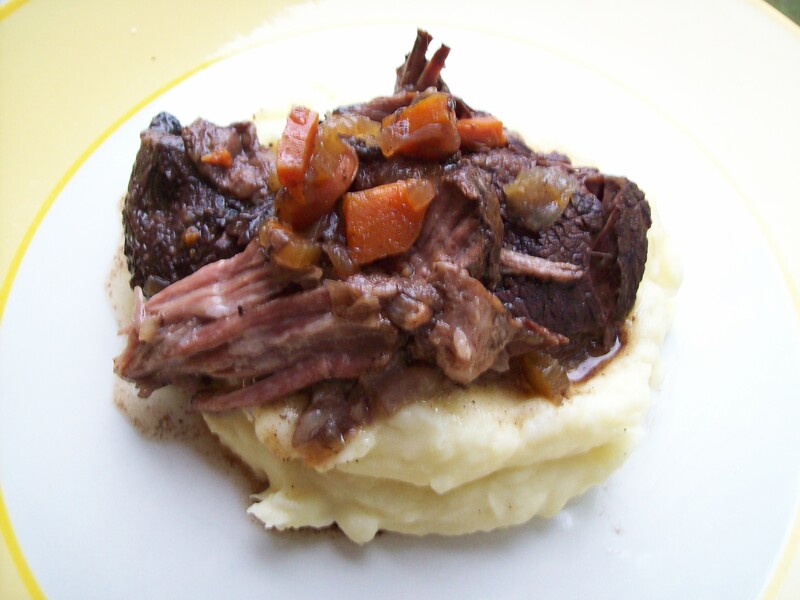 Place the short ribs and any drippings into the bottom of a slow cooker. Add the onions, carrots, and celery. Whisk together the wine, beef stock, and spices, and pour over the contents of the slow cooker. Nestle the orange halves, cut-sides down, into the slow cooker and cover. Cook on Low for 6-8 hours. Allow the contents of the slow cooker to cool; refrigerate overnight. The next day, you’ll find that the fat rendered from the short ribs has risen to the top and solidified. Remove the solid fat from the dish, along with the orange halves. Add the honey to the dish, then cook again on Low for an additional 8 hours. Taste the liquid and adjust the seasonings before serving.